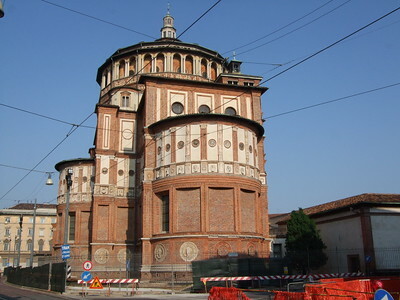 The Church and Dominican Convent of Santa Maria delle Grazie with "The Last Supper" by Leonardo da Vinci is a Renaissance ensemble in Milan. It was built by Guiniforte Solari between 1466 and 1490 on a commission by Dominican monks. Later modifications include work by Donato Bramante in 1492‑1497. The church is famous for the mural of the Last Supper by Leonardo da Vinci. The painting measures 450 - 870 centimeters and covers the back wall of the dining hall at the monastery. The Last Supper specifically portrays the reaction given by each apostle when Jesus said one of them would betray him. It was painted between 1495 and 1498. This is one of these WHS where you really have to make an effort to get in. I already set out 3 months beforehand to book tickets online, and still only a time slot at 8.45 am on Sunday morning was available. The entrance fee is only 6.5 EUR for adults, and free for children and over 65's. I also got a simple audio guide for 3.50. The painting (it's not a fresco) is located in the refectory, accessible at the back of the church via a separate entrance. Every 15 minutes groups of 25 people are let in. You go through a series of electronic doors, opened up one by one to heighten the anticipation. It made me think of the same spectacle at the Altamira Cave. However that is only a replica, while this is the real thing. My mother and I were the first to enter the huge dining hall. It has the Last Supper covering the complete wall on your right hand, and a Crucifixion fresco by Giovanni Donato da Montorfano doing the same on the left. There are benches to sit on from where you can quietly take it all in. The painting is unbelievably bright, it has been restored many times as the paint will not hold very long on the dry wall. Unfortunately they haven't been able to "brush away" the large door opening in the center that hides Jesus' feet. After our scheduled 15 minutes gazing at the paintings was over, we visited the Church & Convent next door. It has a spectacular dome by Donato Bramante, and is quite odd shaped in general. The interior is made out of marble and terra cotta. There is also a lovely cloister. Unless you are very lucky you won’t get in without a reservation and the reservation process is still ‘hit and miss’. Unless you are on a (expensive) tour which includes a visit to the Last Supper, tickets have to be booked through the Vivaticket website (https://www.vivaticket.it/eng/event/cenacolo-vinciano/26482). The website mentions on which date tickets for the following months are released, e.g. in our case the tickets for February and March 2019 were released on December 11, 2018. Be ready to order as soon as possible on these release dates (and register in advance) since in a couple of minutes all tickets for popular days (i.e. Saturday and Sunday) will be sold out. In our case, only a timeslot including a guided tour in Italian was still available. This adds another EUR 3.5 to the EUR 12 ticket price and has to be booked separately. When visiting the church, you first have to swap your online confirmation for a paper ticket in the ticket office. Since we booked a guided tour, we expected a guide but strangely enough this was not the case. However, we (and everyone with the same timeslot) did receive an audioguide which – since we don’t speak Italian – was a better option than a guided tour in Italian. It is now permitted to take pictures but only without flash. As mentioned, the visit lasts for 15 minutes which we felt is enough to admire the painting but a bit short if you want to listen to the full audioguide commentary. The church is best reached by getting off at metro station Conciliazione (red line). From there it is a 5 minute walk and signs are available as from the metro station. 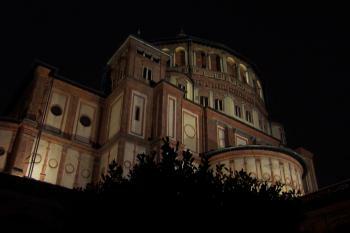 The church of Santa Maria delle Grazie is a curious specimen on the World Heritage list. It is not altogether unremarkable, but also not in any sense surpassing to warrant special recognition. And although its name is fully spelled out in the WH property title, the inscription is entirely devoted to the famous painting that adorns one of the walls of the adjoining convent’s refectory. I first stopped by the church more than five years ago but that visit did not include viewing of Leonardo’s The Last Supper. That was too significant an omission to be able to count the site as visited. In November of 2018 I made an extra effort to see the painting. It is not a trivial exercise. Access to the painting is allowed at 15-minute intervals for groups of 30 people. Demand is always significant, so it is practically impossible to just show up and get in. Prior reservations are essential. I made ours full 3 month in advance. The access procedure is a bit grotesquely over-secure. Large bags need to be placed in lockers at the ticket office and you have to go through a metal detector at the visitor entrance, which nowadays is par for the course at many important museums. But then you and your group of visitors are ushered through a series of automatic glass doors, which only open once the previous ones have closed behind you and the way forward is deemed clear by an invisible dispatcher. The last set of doors is to the refectory itself; until the previous group completely clears the space and the exit doors are closed behind them, you are not granted entrance. Before entering, you are warned that taking pictures is not allowed, “because of the copyright”. The staff did not speak sufficiently fluent English to be able to explain who has the copyright and why. The bottom line is that I do not have any shots of my own of the famous painting. You end up with roughly those 15 minutes to admire The Last Supper (and one other Leonardo’s work on the opposite wall). For a true connoisseur, the time is clearly inadequate. For a layman admirer, it feels about right, but raises an obvious question whether the time and effort spent was worth of, in effect, one single painting, however remarkable. 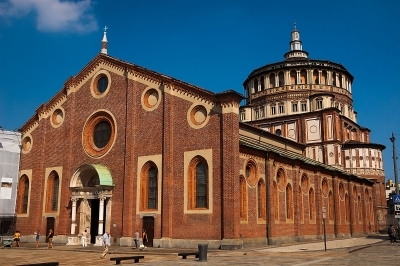 Logistics: The church of Santa Maria delle Grazie is either within walking distance or a few stops of the tram away from any location in central Milan. The church itself is free to enter. To see Cenacolo Vinciano, you can make a reservation for a specific day and time over a phone (the ticketing website proved to be largely useless); if the day of your visit is not flexible from your point of view, you should plan to make this call around 3 months in advance. If calling from the US, get up around 3:30am to ensure that you can get through to the reservation line near the start of the business day European time; none of my attempts to call when it was already afternoon in Italy were successful. You can also buy tickets to one of the multitude of Milan walking tours that include the viewing of the painting on itineraries; such tours apparently buy viewing slots wholesale and may have remaining availability much closer to your desired date; the cost, of course, will be significantly higher, but if you are interested in a group walking tour anyway, it might be just an option for you. The tours release their unused tickets back to the general ticket office, which affords a final option for those who do not plan much ahead: either check the last-minute availability by phone (or on the ticketing website – the only time it is useful is for these final-availability purchases) or simply stop by the ticket office and see if anything is available during your stay in Milan – you may get lucky for later the same day or one of the following days if you have time and flexibility of schedule. Once you have figured out how the booking system works (you have to order tickets around 3 months in advance), and if you are a bit flexible about the date and time of your visit, it works quite smoothly and you can leisurely walk to the counter in the building next to the church (past the rows of tourists who have not made a booking and are told by the staff that they are full for the next weeks) to pick up your tickets (an alternative option seems to be available - book a guided tour of Milan with one of several agencies, and many of these include the church; this can apparently be done on shorter notice). At the appointed time, you walk into the church and then are left alone for about 15 minutes (audioguides are available) to admire one of the great masterpieces of the Renaissance, done by one of humanity's great geniuses - Leonardo's "The Last Supper". I found the visit very pleasant and enlightening, and well worth the effort to book a ticket. The complex of Santa Maria delle Grazie is in the centre of Milan, only a relatively short walk from the Duomo (which would be a WH site in any other country). Unfortunately nearly everything about our visit to Cenacolo Vinciano to view “The Last Supper” turned out to be unsatisfactory - from the booking procedure to the actual visit itself. I know that Milan Museums face tremendous pressure from numbers of people wanting to see it, but things can be “done” better - a few days earlier we had a far superior experience when visiting the Scrovegni Chapel in Padova. Planning several months in advance, I registered with Vivaticket - the agent which seems to have the prime “rights” to sell tickets. (They have also “cornered” the market for the Scrovegni, but we didn’t use them and, on arrival, obtained a late evening ticket for 4 hours later). This was a bit bureaucratic with the need to create an account with password and to activate it from an e-mailed link (Congratulations - you can now book for rock concerts and soccer matches across Italy!). Confusingly they only open bookings every few months for a variable number of months in advance! So in 2016, on Sep 7 they open sales for Nov/Dec but on 8 Oct they only open up Jan sales! I had registered in July and in early August, duly went to the site on the appointed opening day to book my late Sept ticket - but already everything was said to be sold!! Now there are of course other agents selling tickets as part of expensive wider guided tours of Milan and I wonder if they get “First pick”. On 31 August I decided to try again “just in case” and found that some tickets had “come free” and indeed there were now a few available at 9.30 on our preferred day only 28 days hence! The Web site stated that the 9.30 tour would be guided in English. Even though there was no choice not to have the guided tour we were required to book first the entrance tickets and then the tour as separate “Bookings”! (Total cost 15.50 Euro per person - 12 for the ticket and 3.50 for the guide each. Unlike at the Scrovegni there are no reductions for EU citizens aged over 65!). The Web site also sold tickets for rented “Audioguides” but, since no one on our tour had one of these, I can only assume that some tours are “unguided” in any language and that, on these, you have the choice as to whether to rent an audio guide or not. IF that is the case and you can get tickets for a “Non guided tour” I would strongly recommend that you do so. The reason why this should be the case quickly became evident once we had exchanged our reservation for the 4 (!!) paper tickets and were ushered into the climate controlled waiting room. The guide’s English just wasn’t up to the job! Now, as someone who speaks virtually no Italian all, I don’t criticise that - but I do criticise it in someone who is acting as a guide in “English”. Once we were inside the room containing the painting, this, plus the echo effect, meant that, for the entire 15 minutes, we just couldn’t escape the guide’s almost unintelligible droning (there was no problem with the number of visitors - now set at 30). There was absolutely no chance quietly to contemplate and appreciate the object we had come to see! The situation was made worse by guards trying to prevent flash and video photography - an impossible job of course with phones and cameras being used by people who don’t know how to turn off the flash! Quite why video should be banned isn’t clear since, unlike flash, it doesn’t have any potential deleterious effect on the painting and copyright can hardly be an issue in the circumstances. But I managed to incur the wrath of one of these guards by taking a “panorama” still shot (without flash of course)! He had been shouting unsuccessfully for several minutes to prevent unwanted flash and took the movement of my camera to be that of taking “Video” (totally ignoring several others who were really taking video on their mobile phones!!). He clearly considered that my “video” required greater action on his part and he muscled his way aggressively through the group shouting “No Video” and confronted me in an “unpleasant fashion”. The explanation that it wasn’t video at all only brought forth the face saving assertion that “Panorama” wasn’t allowed either! At the Scrovegni, the visit is preceded by a 15 minute video in a climate controlled room next to the chapel which also uses the time required to equalise the climate before the main door into the chapel is opened. A “top quality” explanation is given with English and German subtitles pointing out the main aspects to be looked for and the actual visit takes place in conditions akin to those in an art gallery. In the circumstances we encountered I personally found little “added value” from my visit to the Last Supper other than to “understand” its location and size in relation to the room (Photo). OK, I am no “art expert” and many of those who are assert that, despite the numerous renovations which the painting has undergone during its “life”, what we are seeing is still “real Leonardo”. Wiki however references others who disagree – “This restoration took 21 years and, on 28 May 1999, the painting was returned to display. Intending visitors were required to book ahead and could only stay for 15 minutes. When it was unveiled, considerable controversy was aroused by the dramatic changes in colors, tones, and even some facial shapes. James Beck, professor of art history at Columbia University and founder of Artwatch International had been a particularly strong critic. Michael Daley, director of ArtWatch UK, has also complained about the restored version of the painting. He has been critical of Christ's right arm in the image which has been altered from a draped sleeve to what Daley calls "muff-like drapery". Many of the compositional aspects can of course be studied and appreciated from media without actually seeing the real thing. However, maybe it is true that the painting’s subtle “light” and use of perspective can only be appreciated “in situ” - I am trying to convince myself that this was the case and that the entire exercise was indeed “worthwhile”! I visited this WHS in June 2007. 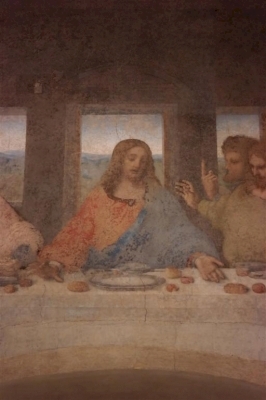 You have to book well in advance to see The Last Supper by Leonardo da Vinci. I was bewildered to learn that this famous masterpiece was for some time a mere stable decoration!!! Unbelievable! The church is beautiful and the town of Milan too. Most of the guidebooks says Milan is nothing special, but i enjoyed the 2 days there much (one more day would be better). There are many places which are worth to see. 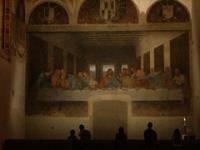 As mentioned below - it is quite difficult to see The Last supper, because of the plenty of tourists who want to see it. For the last moment travellers i can mention www.zaniviaggi.it who has tickets - of course for a higher price as part of a guided tour. This is the way how i got in and i can recommend the tour. The church is very nice, i enjoyed the stay inside as there was a mass and it was quite magical. The painting itself is not in church but in refectory and in the same room is another master piece - Crucifixation. I have been many times in Milan and visited the stunning Gothic and Renaissance complex of Santa Maria delle Grazie built from 1463 to 1490 by Guiniforte Solari, reworked by Donato Bramante from 1492 and restored by Luca Beltrami in 1895, after its transformation in barracks and the begin of the demolition. The façade of the church has a nice portal and the apse, projected by Bramante, has a cubic block of base with lateral apses and the apse of the presbytery in form of a parallelepiped; the dome has sixteen sides, with a gallery of double columns that supports the roof that is supported inside the church by four arches and pendetives. In the interior, projected by Solari, there are three Gothic naves with two rows of columns, ogival vaulting and a double row of lateral chapels. The vaults have nice frescos, discovered after being hid in the 16th century, the pillars of the lateral naves are decorated with frescos of saints painted by Bernardino Butinone and some frescos in the lateral chapels are by Gaudenzio Ferrari. There is also a nice tomb sculpted by Francesco Cazzaniga and a painting by Paris Bordone. 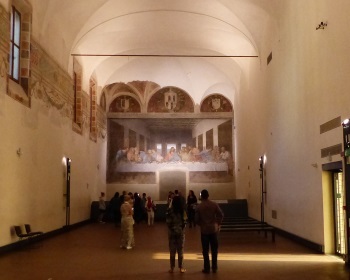 The chapel of Madonna delle Grazie, reconstructed after the Second World War, contains a painting revered during a pestilence that gives name to the complex. The presbytery has a cap vault and some oculus and contains two rows of wooden choir inlayed stalls. The convent, seat from 1552 to 1778 of the Inquisition of Milan, has a beautiful small choir and a sacristy, constructed in 1499 and restored in 1982, that contains the remains of frescos and inlayed and painted cupboards. In the refectory there is the stunning Last Supper by Leonardo da Vinci, that represents the moment when Jesus says to the apostles that somebody of them will betray him. It has big conservative problems because is painted with a particular technique unstable on the plaster. The humidity of the local, the settlings of the wall, that have caused breaks in the support of the painting, are also problems. It was restored many times, the last time from 1977 to 1995. This church is one of the most beautiful places I have ever seen because of the beauty and the perfection of its architecture, but I am disappointed by the fact that I haven't seen yet the Last Supper, that can be viseted only on booking long time before you go there. It's absolutely worth to be visited and justifies the inscription also because the Last Supper is the most famous wall painting in the world, even if the castle and some other churches in Milan (like Duomo, St. Ambrogio, St. Lawrence the Major and St. Eustorgio) could be inscribed alone or with this one. The Last Supper (Canacolo) is such a famous image and I have seen versions of it at many other UNESCO sites made from many materials (salt and iron stand out in my memory) so there is no doubt about the validity of its inclusion on the list. The fresco sits in the refecroy of the convent and is in a reasonably poor state of repair due to restoration attempts, the odd technique that da Vinci employed to apply it and the idea of the Dominicans to enlarge the doorway thus cutting off Christ’s legs. The already famous image has also seen an upsurge in interest due to the international bestseller ‘The da Vinci Code’. It is a very impressive piece of work overall and well worth the hassle of getting tickets and going through several de-humidifying chambers. The church itself is simple with some nice frescos, however the apse (pictured) and cloister designed by Bramante are very impressive and twined with the Cenacolo reflect a large change in artistic style. I am surprised that I am the first person to write a review of this site as it is so famous. The church is in Milan and very easy to reach, the real problems start with being able to get a ticket to see it. You will have to RESERVE well in advance. The link that Els has given above is the official ticket office, and is the best place to get tickets from as they are the cheapest, however when I tried this it was booked up almost entirely for the next 3 months! So look as early as possible. In the end I had to unfortunately go through other channels to get my tickets, an internet search should give you plenty of options the cheapest I found was the confusingly titled www.weekendafirenze.com, in the end it cost me €12,50 per ticket including the audio guide (which I would highly recommend!). Milan itself was a nice city, more functional than touristy, however the Duomo is hugely impressive I am sure if it was in another country it would be a WHS. This site was worth the effort to get to see, it is one of the most famous pieces of art in Western culture and fully deserving of its place on the list. 4.0: Frederik Dawson Klaus Freisinger CAN SARICA Argo Philipp Peterer Antonio J. 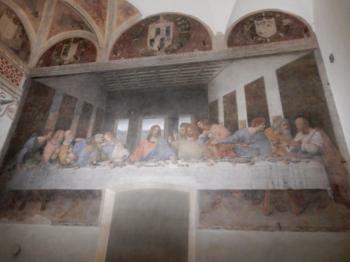 As "Wallpainting of Last Supper". Bureau - Is it "Movable property" and hence not valid? Visitor Limits: Visits last 15 minutes and must be pre-booked; no more than 30 people each turn.